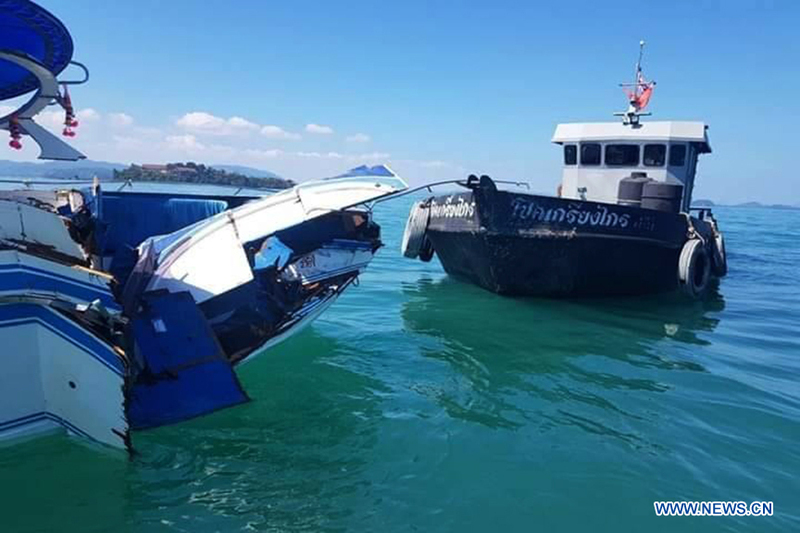 A total of 11 Chinese tourists and two crew members were injured after a tourist speedboat crashed with an oil barge near Thailand's southern Phuket Island on Saturday afternoon, the Chinese Consulate-General in the southern province of Songkhla confirmed on Sunday. The 11 tourists are two families from China's eastern city Hangzhou, six of whom having already left hospital while the remaining five still being treated. The speedboat carrying Chinese tourists was on the way back from a day trip to Koh Phi Phi island to Phuket when it hit the oil barge at about 2:50 p.m. local time. An official of the Phuket Consular Office of the Chinese Consulate-General in Songkhla visited the injured tourists at the hospital in time and called on local authority to treat them and investigate into the accident. A total of 11 Chinese tourists and two crew members were injured after a tourist speedboat crashed with an oil barge near Thailand's Phuket Island on Saturday.